A, well, I guess a month ago now, maybe more, my kid’s school had a garden work day. When I got the email asking for volunteers my ears perked up. Volunteers you say? To plant and help layout a garden you say? I was there in a heart beat…. and I sort of monopolized the thing, I was the most experienced gardener there and I get so excited about such things it is hard for me not to. So this was the “early childhood playground” which is just used by 3-5 year olds. Some years ago before my kids attended here, but not that long ago, they put in this nice garden section with nice concrete raised beds, but then it appears to have been neglected. Some people have planted some things, but not really with much of a plan or without enough upkeep. There were also some raised flower beds up near the school just outside the playground. The issue was, what to plant, where to plant it, and when to plant it. But first we had to clean out the existing beds. The flower beds near the school were mostly empty, except one was overgrown with mint I had that mint dug up and saved but otherwise cleaned out. We then planted that mint in and around the actual playground in areas where it would be contained and not overgrown. This is a great idea for a variety of reasons. Mint is hardy and grows most places, it needs little upkeep, and of course the kids can eat it. Of course they’re told which plant is mint. One of the raised garden beds had some cabbage and some green onions planted, but then also four apple trees and several grape vines. Grape vines, are, quite frankly, a horrible idea for a school garden. Grapes grow like mad, need constant labor and training (in the summer when school is not in session) and ripen generally also in the summer. They’re just a big mess. We tore all the grape vines out. We kept the apple trees. Two yellow delicious and two “babe” apples. The “Babe” ones I would not recommend, tons of suckers, it must be a feature of the cultivar. I couldn’t tell it was an apple at first, I was all “This looks like an apple, but why is it a bush?” the suckers were so thick. But they’re apples, and I AM a fan of apples in a school garden (dwarf trees are best). They provide beautiful flowers in Spring, when school is in session, and apples in Fall, when schools are in session, with very little maintenance needed during summer break (generally none, you won’t be spraying in a playground anyways). The other side had some blackberries, blueberries and a very odd bushes that didn’t look healthy and I couldn’t identify them. We tore them out. The blackberries were thornless, we kept them but I have mixed feelings about it because of the ripening time. There are some summer camps at the school though. Same with the blueberries. The entrance to this garden section had an arch someone had started training what I’m pretty sure is a hardy kiwi up, this we kept and against is what I think is a great vine for a school garden. Hardy kiwi is a great vibrant vine that needs little maintenance (some pruning, basically, once it gets big), nice pretty glossy leaves, and fruit that ripens in fall that children can eat out of hand like grapes. We transplanted the green onions and cabbage to the middle garden beds. I told them if we got lucky maybe they would be able to harvest the cabbage, and so far we’ve been lucky, no frost yet, two weeks after the average first frost date. I also planted some kale, and brought some herbs to donate. Spearmint, rosemary, thyme, and I planted some biennial parsley seeds. The herbs are perennial so they’ll be back year after year in what is now the herb section. I told them they might be able to get a radish crop in with the short time frame, but otherwise the goal was just cleaning up the beds for Spring planting next year. The beds near the school were planted with donated flowers, volunteers were asked to bring divisions out of their yards to plant… alas I was the only one who did so, everyone else went out and bought flowers. Which is fine… but it means they probably don’t garden much at home, which makes me sad. Gardening is so much fun, everyone should do it, am I right? 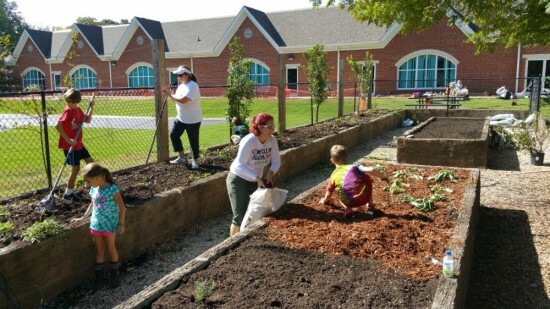 But the goal here was to plant flowers by the sidewalk where all could enjoy them, while keeping the veggies and other edibles within the playground fencing to limit animal browsing. Overall I’m please with the progress we made on the garden, and I’m happy the school has a garden. I really, really, really enjoy gardening with my kids, I like being able to show them where food comes from and there is nothing quite so gratifying as watching your children eat a carrot or a leaf of kale right out of the garden… on their own volition. But of course, not everyone has a garden blogger daddy, so it’ll be nice for other children to get a similar appreciation. 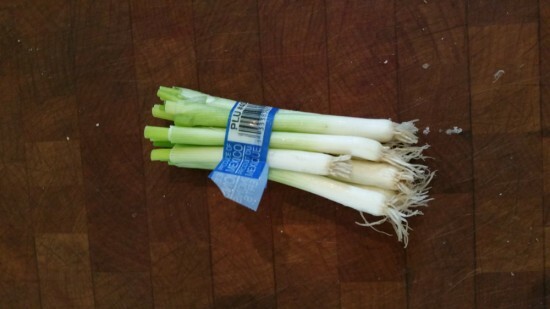 Finally, I also brought some green onions to plant… because I had cooked with them in the past week so I had some. Normally I wouldn’t have these, because when I have a garden I just cut off the tops of green onions, and never dig up the whole plant. But because I am between gardens right now having just moved there were grocery store green onions, which always come with the bottoms, which most people throw away, and others compost, but what should you do with these? Plant them. Plant them and in about two weeks you’ll have more green onions to harvest, it is that quick that they regenerate. What an easy way to build up your onion patch huh? Are you not doing this yet? And they’re small, they need mere square inches of space each, so you can cram then in anywhere. Put some in your eggs in the morning, in soups and stews, in mashed potatoes, so many meals can have green onions added, you can’t go wrong with adding more to your garden. Good to see the younger generation getting involved and earning their green thumbs! Nice post! I think gardening with kids is so important. I have taught my children how to grow and they still remember a lot! I am happy to see some parents still realize how important this subject really is. Great job on your post! Wow I have not done any onion yet, and my neighbor had told me this past season about onions and garlic. I was very interested in reading this post because now I am going to expand my garden with onions. What a beautiful area for the kids to plant, and learn. I planted some garlic cloves in my garden about 4-5 weeks ago, hoping to get them in so they can overwinter, and all of them have sprouted a couple of inches or so already! I live in central Texas and we’ve had a very warm winter thus far. I also took Chris’ advice and planted some green onion. And they too have grown quite a bit since their planting two weeks ago. I never knew one could grow their own onion this way! Thanks for the tip! I’m a new gardener and Chris’ blog has such great advice. Here in the North East it is very difficult to get school farming up and running because of the cold winters. We are currently working to get our Microfarm in as many schools as possible, so year round farming can be done within the classrooms. Just looking at those great raised beds, I wondered if you ever considered planting horse radish there? It seems an ideal medium, and should yield an excellent crop. Horseradish grows almost anywhere – with VERY little care except that the soil must be kept damp. Of course, harvesting and processing of the roots is quite a job. Quite a job with quite a reward too! I grow them here in South Africa – from plants originating in Holland in 1652. Totally different climates – same excellent end product. I just happen to love the syiff – maybe you don’t. But those raised concrete beds are an excellent planting base.